The Bad: A researcher this week published a report regarding the Webkit flaw which was found in Apple’s Safari browser and Ubuntu Linux earlier this year. Turns out, this security flaw still exists in the stock Android 2.0/2.1 browsers. Google fixed this security hole in Android 2.2, but has yet to release a patch for older versions of Android. 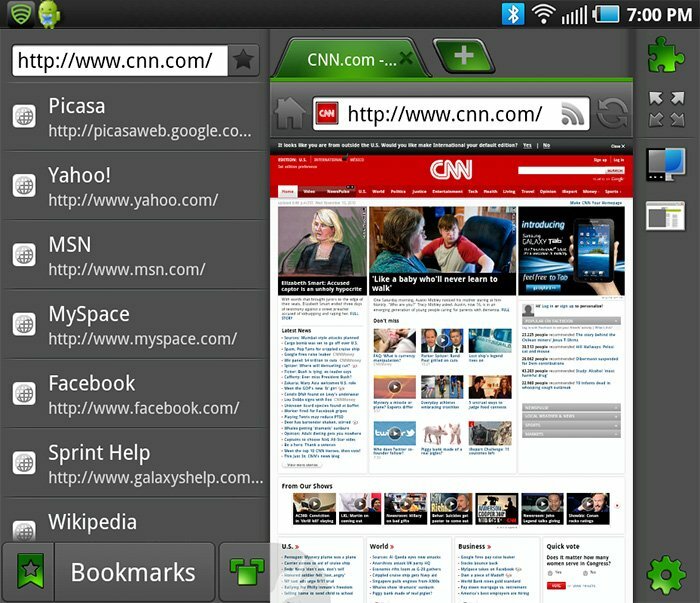 The Good: In the past two weeks, several major developers have released updated web browsers for the Android platform. Most add features which really enhance the mobile web experience. After installing several different browsers on my Samsung Epic 4G, I decided to use CNN.com as a test site. CNN offers two versions of its site, the full desktop version and a streamlined mobile version. It is also fairly easy to switch between the two just by using www.cnn.com and m.cnn.com. 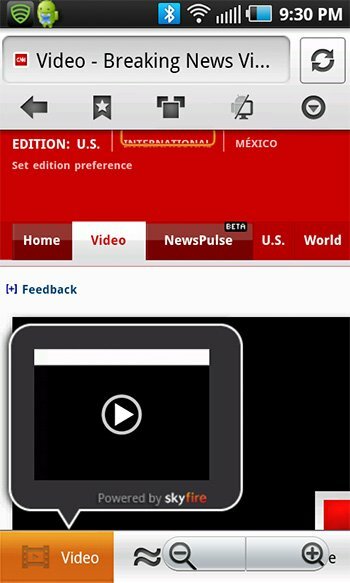 Opera Mobile: Opera Mobile was just released this week. Unlike the Opera Mini browser which pre-renders on the Opera servers, the Mobile version renders directly on your Android smartphone. While it does render fast, it has a very annoying flaw. If the browser detects a mobile site (like CNN’s m.cnn.com), it will force you into the mobile version with NO WAY to jump to the full site. To confirm this, I tried Amazon.com and Bestbuy.com. In both cases, Opera Mobile forced my Epic into the mobile version of the site with no way of jumping to the full site. Opera Mobile does offer a toggle in the Settings to turn Off the Mobile View. However, this did not change the loaded page. And, jumping to the full site was still not possible. 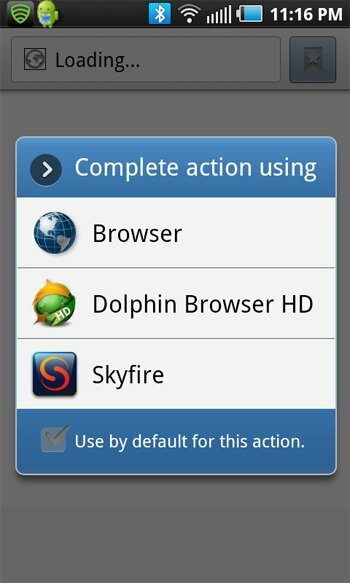 Skyfire: This was the first browser which I installed. Skyfire’s big claim to fame is that it will convert Flash video for playback on Android 2.0/2.1. When a video is detected, Skyfire’s secondary toolbar pops up and shows the converted video. If you click on it, the video plays back in full screen mode. Playback of the converted video is very smooth. Unfortunately, Skyfire only converts Flash video. Interactive Flash files will not be converted. Even with Flash video, sites like Hulu.com and Vimeo are still not supported. As for the regular web browsing, Skyfire has another great feature. In the top toolbar, there is a quick toggle button, to instantly jump from the Desktop website to the Mobile Website. Great Feature! Overall, Skyfire is a very polished browser and handles multiple tabs for browsing. It is still in beta, and the pinch-to-zoom scrolling is not the smoothest. However, there is plenty to like here. Dolphin HD: If you are not interested in Flash video, take a look at Dolphin. It was one of the first alternative browsers on Android and it is very polished.The webpage loads into the full browser screen. Swipe to the right to reveal the Bookmarks on the left side of the browser. Swipe to the right to reveal Add-ons and Settings. Add-ons are widgets available from the Android Marketplace to further customize the browser. For example, I installed the Compact Page Toggle and Desktop Toggle to switch from Mobile Viewing mode to Desktop Viewing Mode. Overall, Dolphin rendered most websites the closest to the real desktop browsers with smooth pinch-to-zoom scaling. It supports multiple tabs and swiping left/right becomes very natural and intuitive. Dolphin is also Flash-ready for when you upgrade to Android 2.2 with Flash 10.1 Lite. Dolphin HD is fantastic on the Samsung Epic 4G. I bet Dolphin HD would be awesome on the new Samsung Galaxy Tab! After you install your new browser, you can set it to be your new default Browser. Just click you Android’s Browser button and the phone should detect the alternate browser. The image on the left shows the pop-up to let you select and check the box to keep this selection as your default. After setting the new default Browser, you can also remove this setting and go back to the standard Android Browser. For example, find the above checkbox in Dolphin’s settings and uncheck. Simple. In the course of researching & writing this article, I have tried most of the top Browsers for Android. I am hooked on Dolphin! It is the closest to a full desktop experience that you can squeeze onto a smartphone. I have already removed Opera, Skyfire, xScope and Steel. Considering, my Love-Hate relationship with Mozilla Firefox, I decided not to try their Mobile version. But, I doubt that I am missing anything. Dolphin is THAT good. I can’t wait to see Dolphin running on Android 2.2 with Flash 10.1!